Today in Masonic History Lyman Hall is born in 1724. 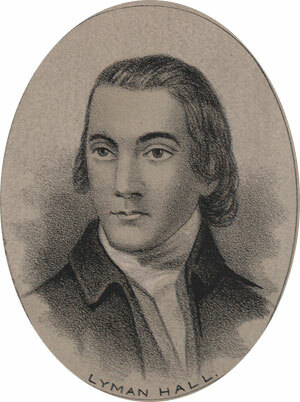 Lyman Hall was an American politician and signer of the Declaration of Independence. Hall was born on April 12th, 1724 in Wallingford, Connecticut. He graduated from Yale College in 1747. In 1749, Hall was called to the pulpit of Stratfield Parish in Connecticut. When he was first to be ordained a group of parishioners opposed his ordination. After two years in the parish, the same group of parishioners accused him of moral misconduct and he was dismissed from the church. It is unclear what the charges were, he did continue to preach for another two years in other parishes. At the same time he was studying medicine and working as a school teacher. Sometime after 1757, Hall moved to South Carolina, just outside of Charleston. It was there that he became part of a community of Congregationalists who had arrived from Massachusetts. When the group moved on to what would become Liberty County in George, Hall went along with them. The new town they founded was called Sunbury and Hall became a leader in the new community. On the eve of the American Revolution, St John's Parish was a hotbed of radical sentiment. This was despite the fact that the area in general predominantly loyalists. Hall convinced the members of the parish that he should be delegate should be sent to the Continental Congress, Georgia has already missed the opportunity to be represented in the First Continental Congress. In 1775 he was admitted to the Congress and became one of three Georgians that signed the Declaration of Independence. Interestingly he was also one of three doctors who signed the Declaration of Independence as well. In 1779, the British burned Sunbury and Hall was forced to flee. When he returned, in 1782, he settled in Savannah, Georgia. The following year he was elected as the Governor of Georgia. In office he advocated for education and laid the groundwork for the chartering of the University of Georgia. Hall felt that education, especially religious education, would result in more virtuous citizenry. Just before his passing in 1790, Hall moved to a plantation in Burke County, Georgia. He passed away on October 19th of that same year. Hall's masonic membership is unclear. It is believed that he was a member of Solomon Lodge No. 1 in Savannah, Georgia. Unfortunately the records of that lodge were burned by the British so his membership can not be confirmed.